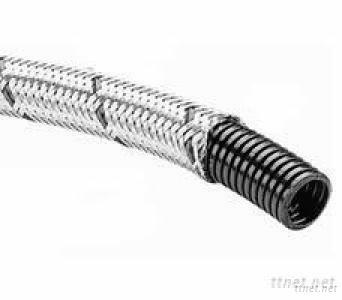 Flexible corrugated nylon conduit consists of inside nylon tube and outside metal wire braided layer. The nylon tube features high bending properties and abrasion resistance. The metal wire braided offers more stability and durability. It is designed to offer superior mechanical and excellent protection for the cables and wires. Widely used for automotive, shipping, mechanical engineering, electronic industry, etc. Material: inside nylon 6, outside steel wire braided. High tenacity and high pressure resistance. Excellent flexibility and good bending properties. Anti-acid, anti-oil, anti-corrosion, flame retardant. Application: wire braided corrugated nylon hose is only used for automotive wires and cables sleeving and for machine tools, factory automation, medical devices, machinery, industrial equipment. It has no other usages such as for water, gas, food, etc.